I just love baked oatmeal. Really any oatmeal. Or oats in general. And this breakfast dish is so rustic and old fashioned, I just adore it. I first discovered it over at Butterlust, a beautiful blog from a fellow Austinite. I adapted it to my taste a bit. And guess what? It's vegan and gluten free. But anyone will love it. The toasty flavor of the steel cut oats mixed with the nuttiness of the walnuts and the natural sweetness of banana... ahhh. Please invite me over if you make it? 1. Preheat the oven to 375F and place your almond milk and water in a saucepan to come to a boil. 2. In a small bowl, mash 1 banana with 1 tablespoon of maple syrup. Set aside. 3. In a cast iron skillet** over medium heat, toast the steel cut oats stirring constantly for about 2 minutes. Add the cinnamon and continue to toast for 1 - 2 minutes, stirring constantly. 4. Once your almond milk comes to a boil, carefully pour over oats. Slowly stir. The skillet will be super watery, but that's okay. 5. Carefully place the skillet in the oven and bake for 20 minutes, or until the oats have absorbed much of the liquid. During this 20 minute period, halve the second banana. Remove the skillet from the oven and arrange the banana slices over the top of the oatmeal. Place back in the oven and bake for another 10-15 minutes. 6. Once all the liquid is absorbed and the mixture is firm, remove from the oven. Let cool for 5 minutes then garnish with walnuts or syrup (optional). *If you choose to use old fashioned oats, don't toast them or boil your almond milk/water mixture. Just add the liquid to the oats and pop in the oven. It will likely need less baking time, so keep an eye on it. **If you don't have a cast iron skillet (mine was 8"), you can substitute a casserole dish. Toast the oats in a regular skillet, then add to the casserole dish with liquid and remaining ingredients. Do you ever get that dip in energy in the afternoon and start wavering on whether or not you want to work out? I know I definitely do. I try to work out in the morning specifically to avoid this conundrum. I'm lucky right now as I finish grad school, in that I have a more flexible schedule and free mornings. But when I was working full time and during my internship, there was no way I was getting up at 4:30am to work out. No siree. And I missed some days in the gym for sure because I was just too drained. My boyfriend doesn't have the luxury of free mornings, so he usually works out after work. But he definitely gets those low energy slumps. This is super hard to overcome when you're sitting all day without proper blood flow. (If you can, try to stretch and walk around 10 minutes each hour. Easier said than done, I know.) Anyway, he noticed that his ability to lift weights and maintain stamina during his work outs was decreased significantly after work. But when he ate a healthy snack, he was able to sustain his energy and lift a lot more weight. So I was watching Trisha Yearwood's cooking show the other day (um, can I just tell you how much I love her?) and she made "power balls" with oats, peanut butter, and chocolate chips. My boyfriend loves all of those ingredients, so I thought this would be a great pre-workout snack! The cool thing is, there is no cooking involved AND you probably have most if not all of the ingredients in your kitchen. Win-win. You just add all the ingredients to your food processor and blend together. I made golf ball sized balls because my boyfriend is a strapping young lad, but you could easily make gumball sized balls too. They are pretty filling, and a lot better for you than those vending machine atrocities. The other morning I had one for breakfast and I was plenty satiated. Slip them in a baggie to take as snacks throughout the day, add them to your kid's lunch as a healthy dessert, or keep in the fridge at work for that afternoon pick-me-up. They taste delish. In a food processor, pulse the oats, peanut butter, honey, chocolate chips, sunflower seeds and flax seeds until fully combined. You may need to stop and scrape the sides a few times. Line a container with waxed paper. 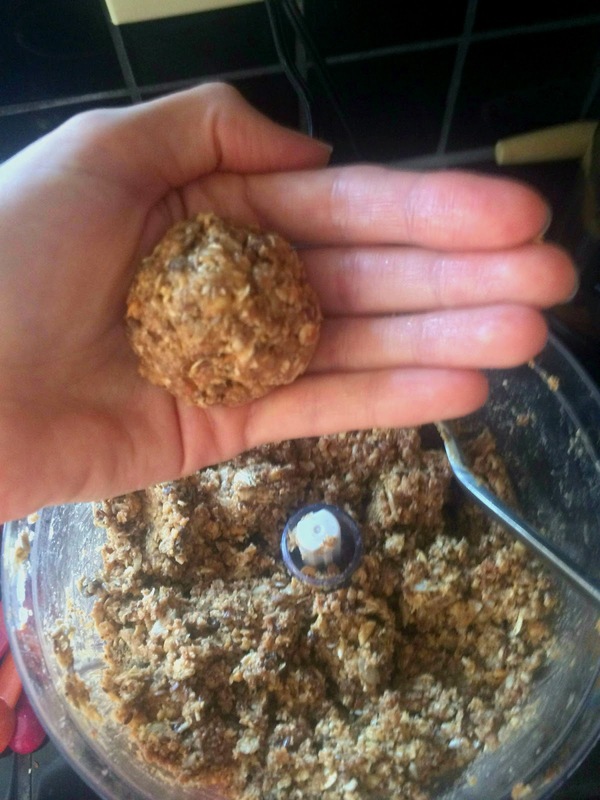 Form balls from the mixture (1 1/2 to 3 tablespoons each) and place them in container. Refrigerate for 30 minutes before serving. Store in refrigerator for up to 2 weeks. There's really nothing quite as tasty, homey, and satisfying as a perfectly baked, perfectly chewy, perfectly buttery, and perfect chocolate ratio as a chocolate chip cookie. I mean, really. What's better? But once you bake up a batch of them, it's hard to resist eating 6 warm cookies right out of the oven, isn't it? For me it is! 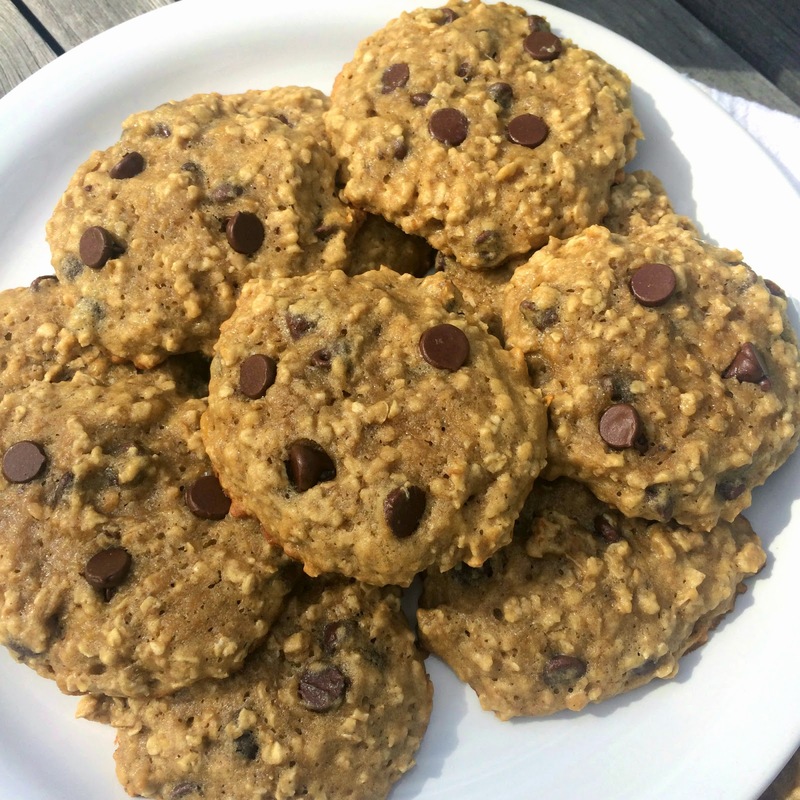 Suppose I were to tell you there are some chocolate chip cookies out there that aren't so bad... suppose I said there's no artificial sweetener or that weird xylitol stuff, no flour substitute, no less flavor. But two lovely additions... oats and bananas. 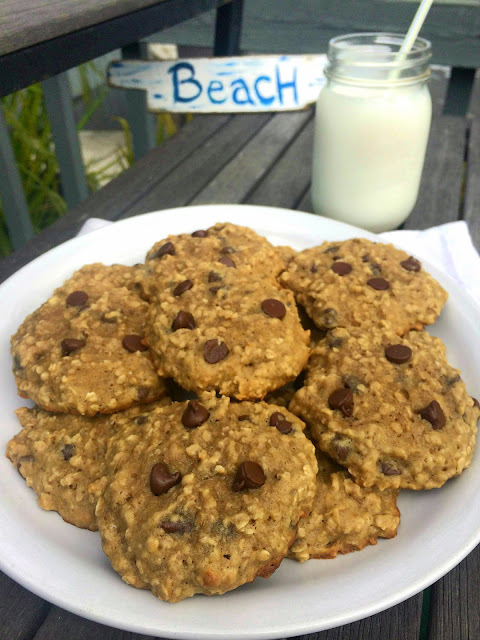 I, personally, love oatmeal chocolate chip cookies and I can whip up a mean batch of those. 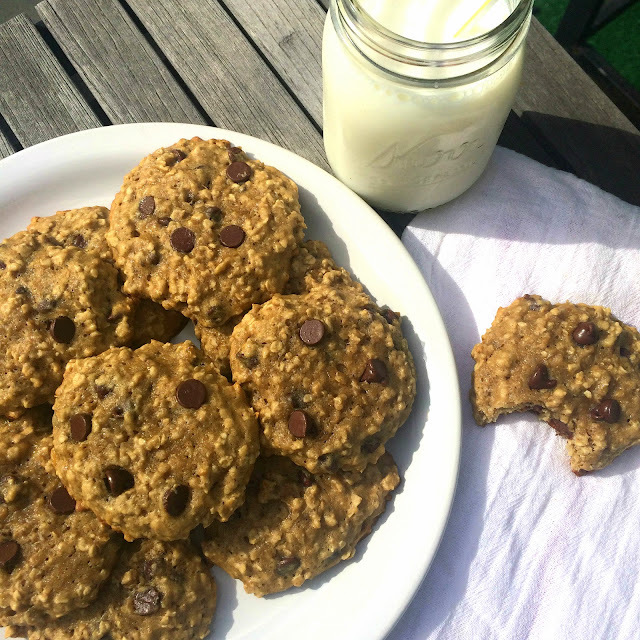 But here we have a lovely dozen oatmeal chocolate chip banana cookies. Because of the natural sweetness of the banana and the extra moisture it provides, you're able to reduce the butter to 1/4 cup and the sugar is lessened as well. They taste like a cross between a chocolate chip cookie and banana bread. They have more of a cakey texture, and they are plenty buttery. It's like the banana tricks you. I love soft cookies, and these hit the mark. I made them for a BBQ we had on my patio, and they were all gone by the end of it. Every last crumb. 2. Whisk together first 5 ingredients in large bowl. 3. Mash banana and lemon juice together in a small bowl until well mashed. 4. In an electric mixer, whip butter until creamy. Add sugars and mix until incorporated. Add in egg and vanilla and mix until incorporated. 5. Add dry ingredients slowly and mix until just combined. Fold in chocolate chips. 6. Drop batter by heaping tablespoonfuls 2 inches apart onto baking sheets coated with cooking spray. Bake at 350° for 10-11 minutes or until just set. They will look under baked, but will continue to cook. This will keep them soft! Cool on pans 2 minutes. Remove cookies from pans; cool completely on wire racks. 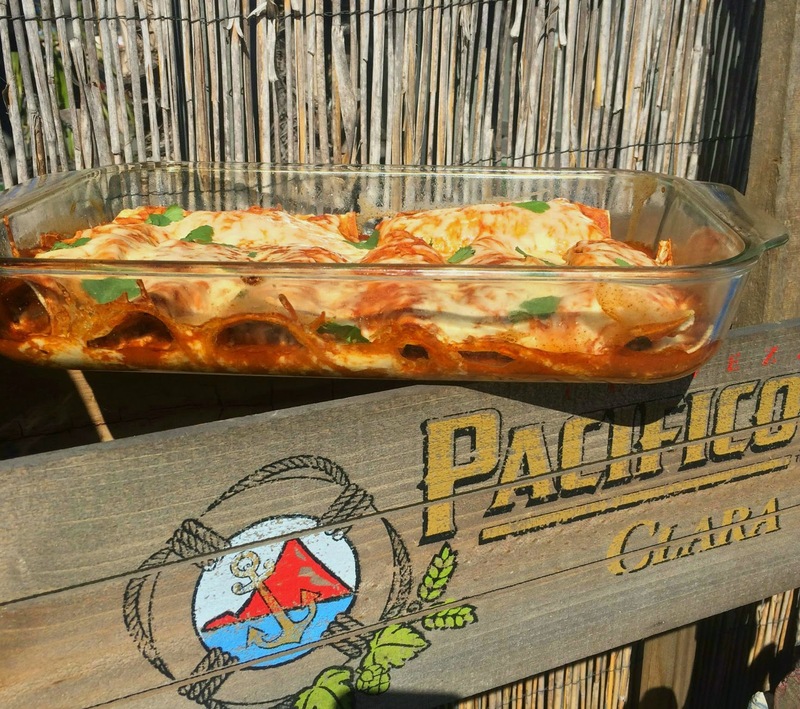 In honor of Texas, I'm posting one of my favorite dishes of all time... chicken enchiladas. Tex-Mex is my absolute favorite food. Queso, Mexican martinis, enchiladas, stuffed avocados, migas... now I'm getting hungry. Anyway, I threw together an enchilada recipe the other day that was so simple, yet sooo Tex-Mexy amazing. I've mentioned how excited I am about the huge patio my new apartment has. Well, how 'bout this Pacifico stand? Really it's more like a trough. I don't quite understand what it's function is. But now I've deemed it a prop for my Mexican dishes. ;-) Nothing better than a cold Pacifico with lime. Along with some enchiladas of course. And queso. And guacamole. Followed my margaritas. Here's an example of all the necessary additions to complete your Tex-Mex meal. Chips and salsa, avocados, tequila. Ole! Oh, and by the way, this recipe makes a LOT of filling. So you can either have very full enchiladas, which is what I did, or make a bunch of little ones. I only used 3/4 cup of cheese in the entire filling. The chicken and black beans have protein to keep you full. Instead of tons of cheese, you get tons of chicken. 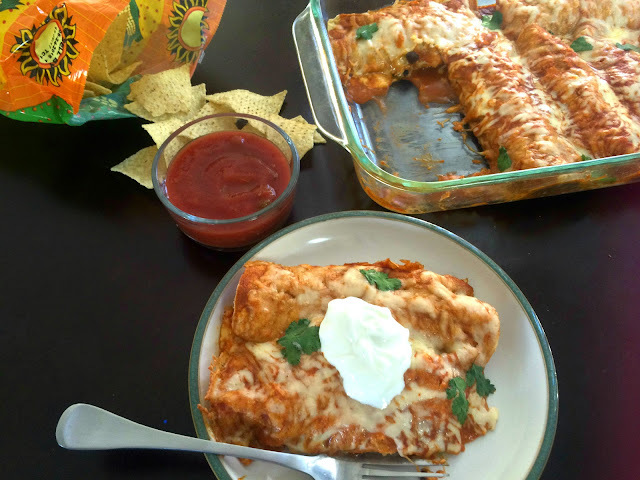 Each enchilada has roughly 250 calories if you prepare the way I did. They warm up fantastically, too. 1. Preheat oven to 350F. Spray a 9x13" baking dish with nonstick spray. 2. If you need to cook your chicken, do so and shred with two forks or an electric mixer. You could also use a rotisserie chicken. I used three cooked breasts and shredded in my mixer. Then I added about 1/2 package of taco seasoning, the black beans, 1/2 cup enchilada sauce and 3/4 cup cheese. Salt and pepper to taste. Mix until combined. Filling will stick together. 3. Pour 1-2 Tbsp enchilada sauce into the bottom of the baking dish and spread around to coat bottom. 4. Set up your tortillas like an assembly line. Brush each tortilla with a thin layer of enchilada sauce then add 1/2 cup or so of filling depending on how large your tortillas are. I found my hands to work well for this by forming the filling into an oval shape. 5. Roll up each tortilla and place seam side down. Pour sauce over the entire dish once all tortillas are done and spread around to coat all tortillas. This helps keep them moist. 6. Sprinkle 1/4 to 1/2 cup of cheese over the top. 7. Bake for about 20 minutes until cheese is all melted.